Envision A World That Survives Nibiru! Envision A World That Survives Nibiru! Here Is What Is Coming! Here Is What We Can Do! Who Can We Trust! 1. Nibiru is a system of celestial bodies, that has entered our solar system in 2003, and has been causing havoc on our planet, in terms of increasing earthquakes, fireballs, bending magnetosphere. 2. Please note that since 2003, we have had unusual weather, which has been becoming MORE UNUSUAL, up until this present moment. 4. At this point, we can see humans are collectively unprepared for what is happening to us right now, and what is to come. 5. 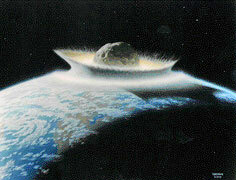 Humans may soon have to deal the collapse of societal systems at the same time, as the following happens from Nibiru. Kolbrin is called a parallel Bible. As with the Book of Enoch (dead sea scrolls), omitted from the Bible. Kolbrin was protected by the Culdians, saved before the burning of Glastonbury Monastery in Scotland, thense to New Zealand. Both the Book of Enoch and the Kolbrin includes more specifics on past and future pole shifts. Were these books omitted from the Bible because the Church wanted mankind unaware? Certainly the Third Secret of the Fatima was not revealed, the Church still holding this close. Kolbrin speaks of the passing planet causing the pole shift as The Destroyer, where the ancient Summerians called it Nibiru, and today we call it Planet X. Red Star Oahspe, Marduk by the Babylonians, Sichin called it the 12th Planet. The Kolbrin is now available from YOWUSA, as low as $4.95 for an ebook. Formerly, only available for $120 with weeks of delay from New Zealand. Having recently come into possession of an ebook copy of the Kolbrin. Kolbin matches closely with what the Zetas have stated within ZetaTalk in describing the PS. I was particularly interested in the timing, trying to establish a timeline. What seems to have emerged is that the major Earth changes, the 3 days of darkness for the northern hemisphere with sunrise West for a few days, comes just ahead of rotation stoppage and the pole shift. Compare the sequence of events described in the Kolbrin to what is occurring today. Here’s what is said in the Kolbrin, page 128, about the Flood. First, that red dust would be seen in the skies, the Moon’s orbit not right. And Noah is given a warning. … They had knowledge of … signs and omens, the secrets of the seasons, of the moon and the coming of the waters. … there were wise men filled with the inner wisdom, who read The Book of Heaven with understanding and knew the signs. … Then the day came when The Lady of the Night changed her garment for one of a different hue, and her form swept more swiftly across the skies. Her tresses streamed out behind in gold and copper, and she rode in a chariot of fire. … the hour of trial draws nigh. The shadow of doom approaches this land … because you have not mingled with the wicked, you are set apart and shall not perish. Abandon your abode and possessions, for the hour of doom is at hand; neither gold nor treasure can buy a reprieve. Second, Noah starts to build his arc, using the Moon’s orbit and red dust as his signal to begin. Noah’s tale carries some interesting suggestions for those concerned about self sufficiency. … It has been told to me in a dream that the ship should be built against the mountains, and the sea will come up to me. … The lowermost was for the beasts and cattle and their provender, and it was laid over with sand from the river. The middle one was for birds and fowls, for plants of every kind that are good for man and beast, and the uppermost one was for the people. … cisterns for water and storehouses for food … the ship was without mast or oars. There were no poles and no openings, except for a hatch beneath the eaves above whereby all things entered. Into the great ship they carried the seed of all living things; grain was laid up in baskets and many cattle and sheep were slain for meat which was smoked by fire. They also took all kinds of beasts of the field and wild beasts, birds and fowls, all things that crawl. They said to the mockers, “Have your hour, for ours will surely come”. Of all the people who entered with him, two understood the ways of the sun and moon and the ways of the year and seasons. One the quarrying of stones, one the making of bricks and one the making of axes and weapons. One the playing of musical instruments, one bread, one the making of pottery, one the care of gardens and one the carving of wood and stone. One the making of roofs, one the working of timbers, one the making of cheese and butter. One the growing of trees and plants, one the making of ploughs, one the weaving of cloth and making of dyes, and one the brewing of beer. One the felling and cutting of trees, one the making of chariots, one dancing, one the mysteries of the scribe, one the building of houses and the working of leather. There was one skilled in the working of cedar and willow wood, and he was a hunter; one who knew the cunning of games and circus, and he was a watchman. There was an inspector of water and walls, a magistrate and a captain of men. Regarding how mankind can prepare themselves. Small cooperative groups, operating in Service-to- Others, where the concerns of all are the concerns of each, will have the best chances. Most important is a cooperative attitude among the group, with a willingness to undertake distasteful tasks, a desire to share among all what little there may be, and a positive attitude toward the future. It is no small matter to have music, poetry, and art. This fills the heart of the musician, poet, or artist as much as the recipient. There will be much need for such distraction, as the days will be dim, and the nights dark and long. Third, and last, the passing planet became visible and caused a pole shift. In this case, the shifting crust and sloshing oceans included a large wave that carried Noah’s boat to a mountain top. The floodgates of Heaven were opened and the foundations of Earth were broken apart. The surrounding waters poured over the land and broke upon the mountains. … storms and whirlwinds were loosed. … There was a time of great heat, then came a time of bitter cold. The waves over the waters did not rise and fall but seethed and swirled. … The stars in the Heavens were loosened from their places, so they dashed about in confusion. There was a revolt on high, a new ruler appeared there and swept across the sky in majesty. … The Destroyer passed away into the fastness of Heaven and the great flood remained seven days, diminishing day by day as the waters drained away to their places. What have the Zetas said about the Flood? They have described a displacement wave coming from the South Pole that funneled up into the Middle East, rising higher in a tidal bore as it was squeezed between India and Africa. The flood occurred in conjunction with the periodic visits of [Planet X], which swings through the Earth’s Solar System causing cataclysmic Earth changes such as pole shifts. The Flood occurred three pole shifts back, approximately eleven millennia ago. The shift prior to that had been slight, so that melting of the poles was slow and incomplete. Ordinarily each pole shift places the old poles in a position where they will quickly melt, facing the Sun. The pole shift ahead of the one causing the flood only moved the old poles slightly, so much of the ice was still remaining. Poles over land have constant runoff when they melt, and settle as the weight of ice presses down, but poles over oceans melt more from the bottom up, leaving caverns of ice honeycombed within as the water can support ice of odd shapes. Thus a vast body of thin ice stretched out over the southern ocean, over the location of the old pole. When the comet caused massive Earth movements this ice sheet fractured and fell into the water, causing a huge displacement and resulting massive wave. This wave was the flood, of legend worldwide. Uneasy, and being a highly Service-to-Other man, [Noah] gave The Call and received visits from a Spirit Guide who responded. He did indeed construct a boat to save himself, his family, and household animals. The story of Noah has been romanticized to include all the animals of the Earth, which doesn’t take much logic to dispel. How big a boat was this? Where the wave was large, it did not cover the entire Earth. How could it? Tidal waves are often shown as rising high, a tower of water crashing down upon hapless humans standing in horror on a beach. It is rather a flood tide, as the oceans are climbing out of their beds, into higher ground, so the leading edge is the highest point of the wave. In Tsunamis, a single line of pressure moves through the ocean, transferring water pressure rapidly from the quake point to where it must stop, at land, thus finally crashing upon a beach. During a pole shift, there is no single line of pressure, the ocean as a whole is on the move because it stays behind while the crust moves, and thus rolls up on land onto the coastline being pulled under it. Here’s what is said in the Kolbrin, page 641, about the Exodus. First, omens in the skies, again. A period of time passes, as women becoming barren is mentioned. Then red dust turning the water blood red and social disruption. The dark days began with the last visitation of the Destroyer and they were foretold by strange omens in the skies. All men were silent and went about with pale faces. Fear walked the land and woman became barren with terror, they could not conceive, and those with child aborted. The days of stillness were followed by a time when the noise of trumpeting and shrilling was heard in the Heavens, and the people became as frightened beasts without a headsman. … The dead were no longer sacred and were thrown into the waters. He who grew no grain now owned a storehouse full. Cattle were left unattended to roam into strange pastures, and men ignored their marks and slew the beasts of their neighbours. No man owned anything. The public records were cast forth and destroyed, and no man knew who were slaves and who were masters. … Plague was throughout the land, the river was bloody and blood was everywhere. Those who did drink from the river vomited it up. The dust tore wounds in the skin of man and beast. Second, the planet comes visible, from the direction of the Sun. A writhing red appearance, with a lashing tail, is described. A darkness, perhaps the 3 days of darkness the Bible predicts, descended. The Doomshape, called the Destroyer, in Egypt, was seen in all the lands, thereabouts. In color, it was bright and fiery, in appearance changing and unstable. It twisted about itself like a coil … It was not a great comet or a loosened star, being more like a fiery body of flame. Its movements on high were slow, below it swirled in the manner of smoke and it remained close to the sun, whose face it hid. There was a bloody redness about it, which changed as it passed along its course. It caused death and destruction in its rising and setting. It swept the Earth with grey cinder rain and caused many plagues, hunger and other evils. It bit the skin of men and beast until they became mottled with sores. In the glow of the Destroyer the Earth was filled with redness. The face of the land was battered and devastated by a hail of stones which smashed down all that stood in the path of the torrent. They swept down in hot showers, and strange flowing fire ran along the ground in their wake. The fish of the river died; worms, insects and reptiles sprang up from the Earth. The gloom of a long night spread a dark mantle of blackness which extinguished every ray of light. None knew when it was day and when it was night, for the sun cast no shadow. The darkness was not the clean blackness of night, but a thick darkness in which the breath of men was stopped in their throats. Men gasped in a hot cloud of vapour which enveloped all the land and snuffed out all lamps and fires. … Ships were sucked away from their moorings and destroyed in great whirlpools. It was a time of undoing. This lashing tail is no mere thing. It is an immense tail, capable of wrapping around the Earth, per the Zetas. The tail has left evidence is the very red clay found in spots around the world, NOT the normal soil color for Earth. There are portions of the Earth that exhibit a red clay soil, Australia and the Southeastern US, but this is not a native soil as much as an accumulation of deposits. Dust clouds, as anyone experiencing a sand storm will attest, have a life of their own. The cloud itself exists because there is some kind of glue holding it together. The dust clings to the debris which clings to the larger debris such as moons, and these cling to Planet X. There is more than gravity involved, as this is too simplistic an explanation, and more than magnetism though the iron ore is certainly more magnetically active than most dust clouds. A tail swirl, moving like a slow moving tornado, approaches Earth which has magnetic as well as gravity attraction. Thus, it is not simply a head-on hit, tail to Earth, as it is also a sideways hit from swirling matter. The tail can wrarp all around the Earth during such a lick. There are no parts of the globe that do not report red dust, frankly. It is perhaps more extreme on those sides of the globe that will be facing the approach, but elsewhere is not exempt. The extreme dusting preceeds the pole shift by days, at most, and occurs at the same time the Earth rotation stops. This rotation stoppage is due to the magnetic attraction that the Atlantic Rift presents. As freshly hardened lava, iron rich, concentrated in a line running from Iceland to Antartica, is presents a gripping point that can be grabbed by Planet X, and held. The dynamics in place as Planet X approaches during the last few days before the coming pole shift are such that rotation stops with a predictable part of the Earth facing the approaching Planet X – the mid-Atlantic Ocean off the eastern seaboard of the United States. This part of the globe is centered between land masses that are fairly neutral in magnetic polarization, but lines up over former lava flows from the renting apart of the continents, the mid-Atlantic rift. The Pacific trench does not carry the same appeal, as it lies deeper under the water and its characteristics differ in composition from the newer magma that has arisen during continental drift. Magma bubbling up in the Pacific is more diffuse than the magma bubbling up in the Atlantic, centered in the rift. Thus, the Atlantic lava beds are gripped, facing the Sun, facing the approaching Planet X coming up from the South along the rift, and causing both Europe, the Americas, and Africa to be on the long day side of the Earth. Rotation stops with the Atlantic Rift facing the approaching planet, which is coming nearly from under the Sun, but not directly under, so Africa and Europe are turned a bit more toward the Sun than the North American continent. Therefore, the Long Day described by Joshua and the long night described by the West Coast indians. As is typical of magnets being pressed toward each other, the larger magnet forced the smaller to move, so they can share a combined field. This is the pole shift, the movement of the crust by at least a quarter turn, described by the Zetas. widen. Subducting plates will subduct greatly. Mountain building will occur suddenly, primarily increasing in areas already undergoing mountain building. All told, the better part of an hour, but at certain stages, only minutes. Plants survive as they are rooted and their seeds are everywhere, and animals including man survive because they travel with the moving plates of the Earth and experience no more severe a shock when the plates stop moving than they would during a Richter 9 earthquake. Where mountain building occurs when the plates stop moving, the stoppage is not simply a sudden jolt, like a car hitting a brick wall. All is in motion, and the stoppage is more like a car hitting a barrier of sand filled plastic barrels – a series of small jolts, occurring in quick succession. Third, the passing planet caused a pole shift. Horrific earthquakes and volcanic eruptions, during days of rotation stoppage preceeding the shift. The East was troubled and shook, the hills and mountains moved and rocked. … The Doomshape thundered sharply in the Heavens and shot out bright lightings. Then a voice like ten thousand trumpets was heard … The whole of the land moved and mountains melted. The sky itself roared like ten thousand lions in agony, and bright arrows of blood sped back and forth across its face. It is thus described in the old records, few of which remain. It is said that when it appears in the Heavens above, Earth splits open from the heat, like a nut roasted before the fire. Then flames shoot up through the surface and leap about. … The Doomshape .. covers about a fifth part of the sky and sends writhing, snakelike finger down to Earth. Midday is no brighter than night. .. Come, the day surely will, and in accordance with his nature man will be unprepared. The Earth turned over, as clay spun upon a potter’s wheel. … The craftsman left his task undone, the potter abandoned his wheel and the carpenter his tools. … Men lost their senses and became mad. On the great night of the Destroyer’s wrath, when its terror was at its height, there was a hail of rocks. … The habitations of men collapsed upon those inside. .. the temples and palaces of the nobles were thrown down from their foundations. Even the great one, the first born of Pharaoh, died with the highborn in the midst of the terror and falling stones. There were nine days of darkness and upheaval, while a tempest raged such as never had been known before. Fourth, and last, the social disruption that follows a pole shift is described. When it passed .. men rose up against those in authority and fled from the cities to swell in tents in the outlands. Egypt lacked great men to deal with the times. The slaves left. Their multitude moved in the gloom of a half dawn, under a mantle of fine swirling grey ash. The night was a night of fear and dread, for there was a high moaning above and fire spang up from the ground. A strange people came up against Egypt and none stood to fight, for strength and courage were gone. The invaders, … came up .. because of the wrath of Heaven which had laid their land waste. … They enslaved all who were left, the old, young men and boys. They oppressed the people and their delight was in mutilation and torture. Pharaoh abandoned his hopes and fled into the wilderness … He lived a goodly life among the sand wanderers and wrote books. Good times came again, even under the invaders, and ships sailed upstream. The air was purified, .. and the land became filled again with growing things. They will find they cannot escape to their enclaves, as expected, but will be trapped with the populace by mechanical or other problems. They will find that their secrets, their locations, the whereabouts of their supplies, are divulged due to careless and distracted employees, or angry employees. They will find that the mercenaries they have hired, and presume they will control, will turn a surly eye upon them well before the shift, and may take their transportation to their safe enclaves away from them well before the shift, such will be the comeuppance they will receive from the thugs they have employed. They will find nothing they have planned working as expected. This will be their lot, and a perfect Karma it is! What have the Zetas said about the Exodus? Recorded both in the Book of Exodus and in Egyptian papyrus, this time, estimated to be 1628 BC by best guess, involved exploding volcanoes and great earthquakes and the heaving of the Red Sea floor. The last passage of the 12th Planet is best remembered as the time of the Jewish exodus from Egypt, but what is not well known is the reason for the exodus. Slaves do not just walk away from their masters, and in particular a large group of slaves, old women and children among them, do not get miles away from their masters in a desert area where lookouts can see for miles. The institution of slavery is maintained by cruelty and punishment, and slaves attempting to escape are punished in a manner that will serve as a lesson to others contemplating such an escape attempt. Hands and feet are chopped off when the slave wanders or reaches where they are not to go, eyes poked out when the slave looks when they were supposed to drop their eyes, and tongues cut out when the speech of the slave is considered too bold. Thus, the Jewish exodus did not occur because this large group just decided to take a stroll one day, anticipating nothing worse than a whipping as the comeuppance should they be discovered. The exodus occurred because their masters were devastated and distracted by problems so severe as to take their minds entirely off their slaves. Would this have been a flooded Nile or a plague of locusts or even celebration where all got drunk? Nothing in the normal course of Egyptian society would have created a situation where the Jews could have left, en mass, or even a situation where they all would have had the courage to leave. They left because the passage of the 12th Planet imposed first a long night and then horrendous earthquakes and volcanic eruptions in nearby volcanoes. Chaos reigned, the very type of chaos that governments throughout the world fear lies in their near future. Guards left their posts, and household servants stole from their masters and crept away in the seemingly never-ending night. The rulers held their heads in worry and discussed among themselves how they might placate the gods. The military elite, used to utter control and tolerating no challenges to their orders, react to chaos by trying to re-establish order. Hysterical troops, unable to comprehend what was happening to them, were in no mood to placate their superiors, and thus the military was engaged with internal battles for some time. It was not until the rotation of the Earth was re-established that the Egyptian rulers and their military leaders were able to regain control of the troops. By that time, as history well tells, the Jewish exodus was a success! Here’s what is said in the Kolbrin, page 637, about the coming times. First, omens in the skies, again, the constellations not where they should be. Until the last days, the approach is stealthy, as a thief in the night. Red light, red dust turning the water blood red. Days of darkness, tail debris falling to Earth. Then the pole shift, with volcanic gloom and dust afterwards, the gray dew of death. Men forget the days of the Destroyer. Only the wise know where it went and that it will return in its appointed hour. It raged across the Heavens in the days of wrath, and this was it’s likeness: It was as a billowing cloud of smoke enwrapped in a ruddy glow, not distinguishable in joint or limb. Its mouth was an abyss from which came flame, smoke and hot cinders. When ages pass, certain laws operate upon the stars in the Heavens. Their ways change, there is movement and restlessness, they are no longer constant and a great light appears redly in the skies. When blood drops upon the Earth, the Destroyer will appear and mountains will open up and belch forth fire and ashes. Trees will be destroyed and all living things engulfed. Waters will be swallowed up by the land and seas will boil. The Heavens will burn brightly and redly, there will be a copper hue over the face of the land, followed by a day of darkness. A new moon will appear and break up and fall. The people will scatter in madness. They will hear the trumpet and battlecry of the Destroyer and will seek refuge within dens in the Earth. Terror will eat away their hearts and their courage will flow from them like water from a broken pitcher. They will be eater up in the flames of wrath and consumed by the breath of the Destroyer. Thus it was in the Days of Heavenly Wrath, which have gone, and thus it will be in the Days of Doom when it comes again. The times of its coming and going are known unto the wise. These are the signs and times which shall precede the Destroyer’s return: … Then will the Heavens tremble and the Earth move, men will quake in fear and while terror walks with them the Heralds of Doom will appear. They will come softly, as thieves to the tombs, men will not know them for what they are, men will be deceived, the hour of the Destroyer is at hand. … The dauntless ones will survive, the stouthearted will not go down to destruction. There will be a great body of fire, the glowing head with many mouths and eyes ever changing. Terrible teeth will be seen in formless mouths and a fearful dark belly will glow redly from fires inside. Even the stouthearted man will tremble and his bowels will be loosened, for this is not a thing understandable to men. It will be a vast sky-spanning form enwrapping Earth, burning with many hues within wide open mouths. These will descent to sweep across the face of the land, engulfing all in the yawning jaws. … The fangs will fall out, and lo, they are terror-inspiring things of cold hardened water. Great boulders will be hurled down upon men, crushing them into red powder. As the great salt waters rise up in its train and roaring torrents pour towards the land, even the heroes among mortal men will be overcome with madness. … The flames going before will devour all the works of men, the waters following will sweep away whatever remains. The dew of death will fall softly, as a grey carpet over the cleared land. Men will cry out in their madness, … save us from the gray dew of death. The cataclysms present those who would survive with several challenges. Hailstones, firestorms with brief period of oxygen depletion, earthquakes of a magnitude mankind has never experienced, rapid mountain building, spewing volcanoes, winds of hurricane force, and tidal waves high enough to sweep over tall buildings. What to do? Practically speaking, to take no chances, one should calculate to a height of 200 feet and be at least 100 miles away from any shore. Volcanoes, new and old, will present those living nearby with sudden activity during the cataclysms, with little warning. For man, being in the center of large land plates is a safety factor. For man, staying away from the edges of plates where very molten lava can seep and explode, during pressure of plate movement, is a significant safety factor. Remove yourselves from areas where mountain building is likely to occur. Flat plains or plateaus are safest. The earthquakes will essentially level all cities, and of course railways, landing strips, and highways and bridges will be unusable. Don’t figure on any power or water systems to be functional, and the telephones will surely be permanently dead. Batteries may be handy, but won’t last long and will not be replaceable. Your mechanical and electrical structures will suffer damage from violent earthquakes more than your flesh and bones. You may bruise and break, but you heal. Your electrical device will stay broken. When the earthquakes are expected, lie flat. In this way you will skid and slide a few feet. Standing, or positioned at a height, you will be dashed. And by all means, do not be under a structure that will fall upon and crush you. Metal roofs will deflect the firestorms and hailstones also, if sufficiently thick. The thickness of a protective metal plate is not as important as simply being metal, not bursting into flame. Thin metal can bend and crumble under pressure, where thick metal might shear or snap, having less flexibility. Where the metal is deemed to be protection from falling ash and rocks from exploding volcanoes, the thicker the better. For large meteors, which are few, there is no safety measure to be taken. So where are we today, in omens in the skies and red dust? Since December 2003 we have the constellations not where they should be, offset by serveral degrees and too high in the dome, for instance, with a documented Earth wobble ongoing during this time. We have the Moon’s orbit tracking to the extreme South after the Full Moon, and to the extreme North after the New Moon. We have a slight red dusting noted by many around the world, and red skies and a blood red moon outside of what would be expected. Certainly the signs that set Noah to building his Arc are here. Just when the Destroyer will be visible as a writhing fire ball and the rivers turn blood red, no one knows. -Fireballs raining down from the sky. -Everything on the surface of earth burning. -Did anyone ever tell you that big winds several hundred miles per hour, could easily be possible. 7. Now that I have your attention… can you consider that all prophecies including native, zeta, are converging with modern science… and all are coming to the same conclusion? Even the galactics? Are you aware that all beings that are aware have all come to the same conclusion? You are aware that governments of the world are also aware of the information I am sharing? Are you aware that you may be one of the last groups of people to know, and those around are less educated on these matters than you? 10. Are you aware that if you envision a world that survives Nibiru, it is not about protecting yourself… it is about living to the value of LOVE AND ONLY LOVE… because all that is not love, is being washed away? 11. Are you aware that humanity is coming out of thousands of years of brainwashing to be slaves to money, and to someone else? Are you aware that humanity had been under a planetary take over by dark forces, that have already lost their takeover attempt? 12. Are you aware that to survive the coming times, does not involve much more than what I have suggested, and that it can be even an enjoyable time… after all, are not the majority unhappy with their enslaved situation…. are the majority of humans searching for something that they cannot put their finger on? 13 IT IS UNDERSTANDABLE THAT HUMANS ARE SEARCHING FOR SOMETHING THEY CANNOT PUT THEIR FINGER ON, BECAUSE HUMANS HAVE BEEN LIED TO FOR A LONG TIME, AND THEY DO NOT KNOW HOW MUCH. 15. Envision a world where Sananda is welcomed… and the millions of HIS ships stationed around our solar system. 16. Never trust anyone who would lie to you in chaos… for they seek to benefit by creating hell on earth… trust those who would speak the truth in chaos, they are our friends. Humanity is searching for spiritual meaning… but if Jesus (aka Sananda) weirds you out, then you have problems, because Sananda happens to know all the answers that YOU ARE SEARCHING FOR. Know that their is a spiritual cause for every physical consequence. You must learn this lesson, to avoid repeating the same lessons over and over again. Know that without a spiritual foundation, you will be lost in someone elses creations… that are probably designed to enslave you. Know that Sananda has the intention to free humanity. 17. We realize that we must learn to love and unite, to survive, it is not about surviving by withholding love. 18. We realize there may be millions of humans who may be evacuated from coastlines, and who may seek refuge in new lands. 19. We realize all this cleansing shall open up all humans remaining on earth, to love, and that these ones, shall be led by the women and children as a general rule… and no one shall ever allow themselves to be ruled by babbling fools who only seek to serve themselves. 21. Some may scoff at these words, but those ones, do not know why our planet is wobbling… these ones do not know where the fireballs are coming from… these ones do not know why our magnetosphere is bending… these ones do not know why their leaders will abandon them. You tip someone for a cup of coffee, a beverage or a meal… so thanks for learning the new paradigm shift, of tipping someone who has served you something much more valuable than coffee, perhaps even saving the lives of you and your loved ones. Every tip comes with a free song, THE SOUND OF SOUL AWAKENING. Zecharia Sitchin described Nibiru according to Sumerian cosmology as the 12th planet. Nibiru is home to an alien race called the Anunnaki an extreme advanced extraterrestrial civilization. Researchers have talked about the possibility of a giant planet that has an extreme strange orbit around our sun. In 2008, Japanese researchers announced that according to their calculations, there should be an “undiscovered” planet at a distance of about 100 AU (astronomical units) that has a size of up to two-thirds of the planet Earth. These calculations support the hypothesis of the existence of Nibiru, or Planet X. Here we bring you 20 things you should know about the mysterious planet Nibiru. The name “Nibiru” originated from the ancient Sumerians, who once inhabited ancient Mesopotamia, modern-day Iraq. It is the twelfth planet describe by Zecharia Sitchin. Nibiru is also called Marduk, and it arrives to our solars system with a extreme clockwise elliptical course. According to several ancient texts from Mesopotamia, there is strong evidence that supports theories that Nibiru, has an orbital period of 3600 years. The number 3,600 was represented by the Sumerians as a large circle. The expression for the planet, the “shar” also means a perfect circle or full circle and also represents the number. Ancient Astronaut theorists believe that the convergence of the three concepts – planet / orbit / and number 3,600 – could not be a coincidence. Strangely, The periods of the kingdom were also multiples of shar, 3,600 years, leading to the speculation that the empires shares were related to the orbital period of 3600 years. NASA has identified a planet with an anomalous orbit around our Sun, they refer to it as Planet X. The Washington post and other news agencies wrote about it in 1983 and the coming years. R. Harrington wrote a very interesting article in the Astronomical Journal in 1988. Harrington suggested that a planet three or four times the size of Earth existed, having a position of three or four-time further from the sun than Pluto. According to mathematical models that were presented, it is believed that Planet X or Nibiru, has an extreme elliptical orbit of 30 degrees. 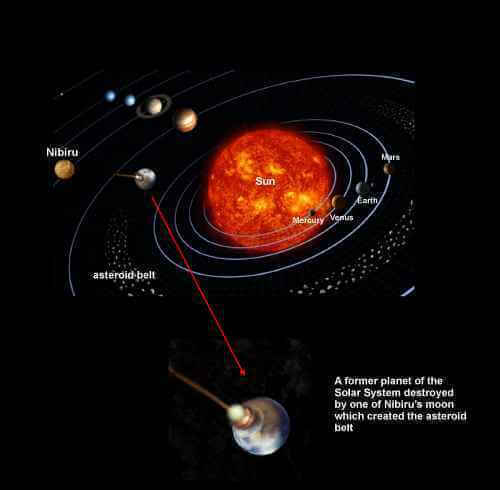 It is believed that the planet originated from the Orion constellation, passing near our planet and coming towards it from the Sun, after making its way by Earth, it head towards outer space and “disappears” . Mythologically speaking, it has the appearance of a fiery beast, appearing in the sky as a second sun. Nibriu is a magnetic planet, causing the Earth to tilt in space as it passes. Nibiru is believed to have 4 times the diameter of Earth and is 23 times more massive, a truly gigantic planet. According to ancient texts, Nibiru Is wrapped in a cloud of dust iron oxide red, making the rivers and lakes acquire a reddish color. It is believed that it would cause days of obscurity while passing next to other planets, possibly even stopping their rotation during its transition across space due to its incredible magnetic properties. Nibiru is also associated with great dangers. Some researchers believe if a planet like Nibiru would come close to Earth, it would cause large earthquakes, tsunamis, volcanic eruptions creating an entirely new geography and climate. It is called ” The Destroyer” in the Kolbrin, a parallel bible located in the monastery of Glastonbury in Scotland; Men forget the days of the Destroyer. Only the wise know where it went and that it shall return at the appointed time. … It is the Destroyer … Its color was bright and fierce and ever-changing, with an unstable appearance … a fierce body of flames. On October 23, 1996 an article from AP called “New rebel planet found outside the solar system” states the following: A new planet that breaks all the rules about how and where planets form has been identified in orbit of a twin star about 70 light years from Earth in a constellation commonly known as the Northern Cross. The new planet has a roller coaster like orbit that swoops down close to its central star and then swings far out into frigid fringes, following a strange egg-shaped orbit that is unlike that of any other known planet. 1. It shows ‘something’ coming in from south of the sun, which is what Zetas have said, is the trajectory path of Nibiru. 2. If it was a lens flare, then the flare would be IN FRONT OF THE CLOUDS, not behind the clouds! 3. Also Zetas have said that Nibiru would be seen first, in the southern hemisphere. “Not far behind the twins will come the Purifier – The Red Katchina, who will bring the Day of Purification. On this day the Earth, her creatures and all life as we know it will change forever. There will be messengers that will precede this coming of the Purifier. They will leave messages to those on Earth who remember the old ways. “The messages will be found written in the living stone, through the sacred grains, and even the waters. (Crop Circles have been found in ice) From the Purifier will issue forth a great Red Light. All things will change in their manner of being. Every living thing will be offered the opportunity to change from the largest to the smallest thing. “It is important to understand that these messages will be found upon every living thing, even within our bodies, even within a drop of our blood. All life forms will receive the messages from the twins… those that fly, the plants, even the rabbit. The appearance of the twins begins a period of seven years will be our final opportunity to change our ways. Everything we experience is all a mater of choice. “Many will appear to have lost their souls in these final days. So intense will the nature of the changes be that those who are weak in spiritual awareness will go insane, for we are nothing without spirit. They will disappear, for they are just hollow vessels for any thing to use. Life will be so bad in the cities that many will choose to leave this plane. Some in whole groups. “Only those who return to the values of the old ways will be able to find peace of mind. For in the Earth we shall find relief from the madness that will be all around us.It will be a very hard time for women with children for they will be shunned, and many of the children in these times will be unnatural. Some being from the Stars some from past worlds, some will even be created by man in an unnatural manner and will be souless. Many of people in this time will be empty in Spirit they will have Sampacu. No life force in their eyes. “As we get close to the time of arrival the Purifier there will be those who walk as ghosts through the cities, through canyons they will have constructed in their man made mountains. Those that walk through these places will be very heavy in their walk, it will appear almost painful as they take each step for they will be disconnected from their spirit and the Earth. “After the arrival of the twins, they will begin to vanish before your eyes like so muck smoke. Others will have great deformities, both in the mind and upon their bodies. There will be those who would walk in the body that are not from this reality, for many of the gateways that once protected us will be opened, there will be much confusion. Confusion between sexes, and children and their elders. “Life will get very perverted, and there will be little social order, in these times many will ask for the mountains themselves to fall upon them just to end their misery. Still others will appear as if untouched by what is occurring. The ones who remember the original teachings and have reconnected their hearts and spirit. Those who remember who their mother and father is. The Pahana who have left to live in the Mountains and forest. “When the Purifier comes we will see him first as a small Red Star which will come very close and sit in our heavens watching us. Watching us to see how well we have remembered the sacred teachings. “This Purifier will show us many miraculous signs in our heavens. In this way we will know Creator is not a dream. Even those who do not feel their connection to spirit will see the face of creator across the sky. Things unseen will be felt very strongly. “Many things will begin to occur that will not make sense, for reality will be shifting back in and out of the dream state. There will be many doorways to the lower world that will open at this time. Things long forgotten will come back to remind us of our past creations. All living things will want to be present for this day when time ends, and we enter the forever cycle of the Fifth World. “We will receive many warnings allowing us to change our ways from below the Earth as well as above. Then one morning in a moment. We will awaken to the Red Dawn. The sky will be the color of blood, many things will then begin to happen that right now we are nor sure of their exact nature. For much of reality will not be as it is now. “There will be many strange beasts upon the Earth in those days, some from the past and some that we have never seen. The nature of mankind will appear strange in these times we walk between worlds and we will house many spirits even within our bodies After a time we will again walk with our brothers from the Stars, and rebuild this Earth. But not until the Purifier has left his mark upon the universe. “No thing living will go untouched, here or in the heavens. The way through this time it is said is to be found in our hearts, and reuniting with our spiritual self. Getting simple and returning to living with and upon the Earth and in harmony with her creatures. Remembering that we are the caretakers, the fire keepers of the Spirit. Ourrelatives from the Stars are coming home to see how well we have faired in our journey. As this and other prophecies suggest, the red kachina/Nibiru/ThePurifier/TheDestroyer will cleanse the surface of all that is not love… and it ain’t gonna be pretty… you the reader, may be sorted out of God’s earth plan, if you seek to control others, and offer nothing unified to the whole. The time of separation consicousness on planet earth, is ending. Sooooo stay tuned and prepare, we are on the verge of a global sea-change. It offers an explanation for the seemingly periodicity of mass extinctions that have occurred throughout the history of the earth. It has been shown with the fossil record that mass extinctions have occurred on average, a cycle of every 26 to 34 million years. According to this theory, the sun has a companion star called the Nemesis, which agitates the Oort cloud as it orbits around the sun. The Oort cloud is a comet belt that orbits the sun; extending tens of thousands A.U ( the distance from the earth to the sun). The gravitational field of the Nemesis causes some comets to stray from heir normally stable orbit. These comets would hit the earth; causing varying levels of global extinction with such devastating effects such as acid rain, deep freeze, and ozone loss. These comet showers would last anywhere from 100,000 years to 2 million years with approximately 10 impacts occurring in intervals of 50,000 years between each impact. The Nemesis Theory stems from the discovery of a crater 10 km in diameter which is believed to have caused the extinction of the dinosaurs 65 million years ago. This period of extinction resulted in the death of 95% of all living creatures. For one to first consider the Nemesis Theory, one must first accept the notion that mass extinctions have occurred periodically. By examining the fossil record of marine fossils, Dave Raup and Jack Sepkoski have gathered data showing the statistical estimation of extinction as shown in the picture on the right. 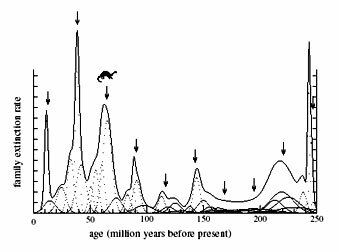 The arrows are plotted every 26 million years and as one can see, they correlate for the most part to the peaks of extinction. The dinosaur icon refers to the end of the “Age of Reptiles.” This graph displays a periodicity of extinction, essential to the Nemesis Theory. This regularity of extinction has also been shown to exist from data collected from fossil genera of Raup and Sepkoski. 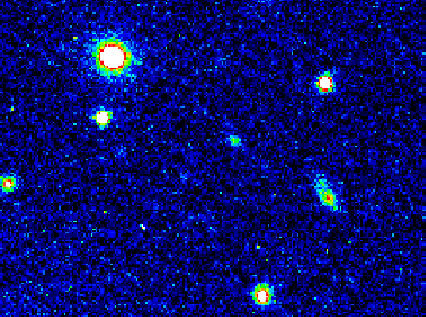 Evidence for the Nemesis Theory can also be found with the discovery of high concentrations of iridium which is only found in extraterrestrial objects such as comets. These traces of iridium can be found in samples of limestone at more than 25 sites around the world. They provide a geological history of the end of the Cretaceous and the beginning of the Tertiary Period, which marks the extinction of the dinosaurs. Between the limestone of these two periods which is known as the K/T boundary, is found a layer of red clay. When tested, this layer of clay was found to be 600 times richer in iridium than that of the surrounding limestone layers. It has been shown that the iridium found at the 25 different sites come from the same source. By measuring the concentration of elements that are usually found with iridium such as gold and platinum, it can be determined through a comparison of the ratio of the elements that the iridium is a result from one unifying source such as a comet. With a further contemplation of the iridium data collected from the limestone, it has been deduced that the presence of iridium was a result of a collision of a comet with a 6 mile diameter, with the earth. An impact of such magnitude, would cause fine dust particles to rise into the stratosphere; blackening the sky and leaving the world in perpetual darkness. These conditions would create an uninhabitable environment and therefore the extinction of living creatures. Another line of evidence not based on terrestrial effects, is found by cosmic ray exposure. Meteorites created by comets have been shown through cosmic ray exposure to have fallen to earth at approximately during the same time of the last three extinctions. Cosmic ray exposure is determined by measuring certain types of isotopes, such as Neon 21 in meteorite samples. It is used to discover the time since formation, the meteorite spent orbiting the solar system. The meteorites that would indicate an impact of a comet would be a high- iron or “H chrondites” which receive their high- iron content from the iron rich cores of asteroid or planets that were blasted by collisions with comets. A correlation of these “H chrondites” have been found with the occurrences of mass extinctions; giving further evidence of the Nemesis Theory. With the discovery of paleomagnetism, the reversals of earth’s magnetic field another piece of evidence was added to the Nemesis Theory. It was hypothesized that when a comet hit the earth, water near the equator due to extreme temperatures, evaporated and turned into ice and snow on polar caps. Due to conservation of angular momentum, a redistribution of mass would be a great enough agitation to alter the magnetic field. These geomagnetic reversals, through the research of Dave Raup to have occurred 296 times and approximately every 30 million years; correlating with the theory of the death star. A drop in sea level which would result from a bolide impact would also occur. This has been shown to exist at the K/T boundary. The probability of a companion star also gains support by the fact that more than 50% of stars in a galaxy are in a binary system, which would lead one to conclude that a “death” companion star to the sun to be a probable reality. Volcanoes were first though of as an explanation for the mass extinctions that have occurred throughout earth’s history, however they do not explain the periodicity of extinction periods. They also do no explain the existence of high concentrations of iridium. Meteorites could also account for extinction, yet due to the randomness of their nature, they can not explain the recurring cycles of extinction either. 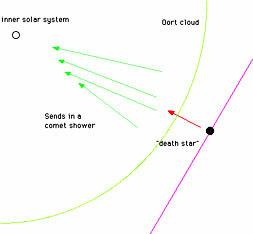 With an acceptance of the bolide impacts originating from the Oort cloud, varying sources of gravitational pull that would result in a comet shower also arise. Molecular dust clouds found in the Milky Way were considered, yet the dust clouds would be too thinly dispersed to cause enough gravitational force. Another source comes from a hypothesized 10th planet called “Planet X“. This theory however would require an inner disk in the Oort cloud which could not remain stable. 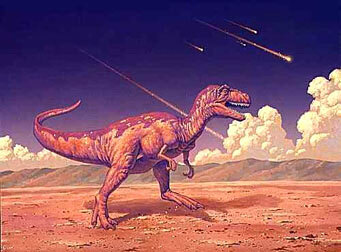 Some argue that the extinction of the dinosaurs would not happen in 1 to 2 years, yet would occur gradually with the decline of species and would use this information as a negation of the Nemesis Theory. However the Nemesis Theory does not require an immediate extinction of life, for some forms of life could have survived the first the impact and later be killed by another impact that would hit at later time. Others argue that the proposed elliptical orbit of the Nemesis star would not be able to be maintained and that the companion star would have long left our solar system. Yet the developers of the Nemesis theory state that the orbit is not constant with time and that the orbit was once closer to that of the sun. Objects such as passing stars would have; through their gravitational field, caused the orbit of the Nemesis to become larger and less stable. Also because the Nemesis Theory is not precise; extinctions occurring within a range of 26 to 30 million years, that the theory is invalid. However, this apparent problem in the theory can be explained by passing stars which would cause a deviation in the orbit of the death star, resulting in a change of a few million years, without disrupting its orbit. The ultimate evidence, supporting the Nemesis Theory, would of course be the actual discovery of the Nemesis star. It is predicted that the Nemesis is probably a red dwarf star with a magnitude between 7 and 12. Its size is believed to be a third of the sun’s and 1/1000 as bright. It is thought that the Nemesis star is right under our noses; being able to be seen with a pair of binoculars. The reason it has not been discovered is that though all stars have been catalogued, only a few of their distances have been measured; making it difficult for scientists to pin point which star could be the Nemesis. 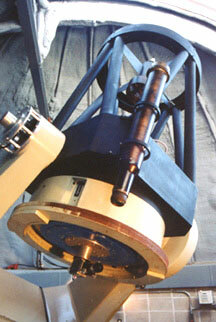 The search for the Nemesis in underway at the Leuschner Observatory in Layfette California with an automated telescope. To determine which star is the Sun’s companion star, photographs of 5,000 red stars have been taken along with the measurement of the apparent shift in position determined by a second photograph picture taken 2 to 6 months later. A little change in position indicate that the stars are far away. However, stars that are close enough to possibly be the Nemesis will show a significant shift in position. 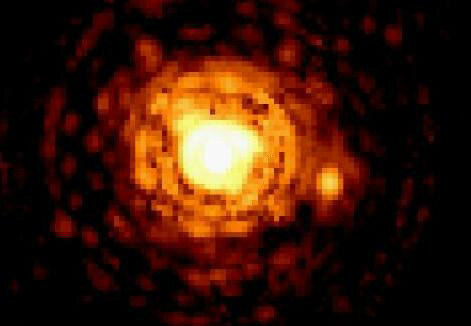 It is guessed that the Nemesis star will be discovered in the Hydra constellation. Goldsmith, Donald. Nemesis. New York: Walker and Company, 1985. Zecharia Sitchin (Russian: Заха́рия Си́тчин; Azerbaijani: Zaxariya Sitçin) (July 11, 1920 – October 9, 2010) was an Azerbaijani-born American author of books proposing an explanation for human origins involving ancient astronauts. Sitchin attributes the creation of the ancient Sumerian culture to the Anunnaki, which he states was a race of extraterrestrials from a planet beyond Neptune called Nibiru. He believed this hypothetical planet of Nibiru to be in an elongated, elliptical orbit in the Earth‘s own Solar System, asserting that Sumerian mythology reflects this view. Sitchin’s books have sold millions of copies worldwide and have been translated into more than 25 languages. Sitchin’s ideas have been rejected by scientists and academics, who dismiss his work as pseudoscience and pseudohistory. His work has been criticized for flawed methodology and mistranslations of ancient texts as well as for incorrect astronomical and scientific claims. Sitchin was born in the Azerbaijan SSR, but was raised in Mandatory Palestine. He received a degree in economics from the University of London, and was an editor and journalist in Israel, before moving to New York in 1952. While working as an executive for a shipping company, he taught himself Sumerian cuneiform and visited several archaeological sites. Similar to earlier authors such as Immanuel Velikovsky and Erich von Däniken, Sitchin advocated hypotheses in which extraterrestrial events supposedly played a significant role in ancient human history. According to Sitchin’s interpretation of Mesopotamian iconography and symbology, outlined in his 1976 book The 12th Planet and its sequels, there is an undiscovered planetbeyond Neptune that follows a long, elliptical orbit, reaching the inner solar system roughly every 3,600 years. This planet is called Nibiru (although Jupiter was the planet associated with the god Marduk in Babylonian cosmology). According to Sitchin, Nibiru (whose name was replaced with MARDUK in original legends by the Babylonian ruler of the same name in an attempt to co-opt the creation for himself, leading to some confusion among readers) collided catastrophically with Tiamat (a goddess in the Babylonian creation myth the Enûma Eliš), which he considers to be another planet once located between Mars and Jupiter. This collision supposedly formed the planet Earth, the asteroid belt, and the comets. Sitchin states that when struck by one of planet Nibiru’s moons, Tiamat split in two, and then on a second pass Nibiru itself struck the broken fragments and one half of Tiamat became the asteroid belt. The second half, struck again by one of Nibiru’s moons, was pushed into a new orbit and became today’s planet Earth. According to Sitchin, Nibiru (called “the twelfth planet” because, Sitchin claimed, the Sumerians’ gods-given conception of the Solar System counted all eight planets, plus Pluto, the Sun and the Moon) was the home of a technologically advanced human-like extraterrestrial race called the Anunnaki in Sumerian myth, who Sitchin states are called the Nephilim in Genesis. He wrote that they evolved after Nibiru entered the solar system and first arrived on Earth probably 450,000 years ago, looking for minerals, especially gold, which they found and mined in Africa. Sitchin states that these “gods” were the rank-and-file workers of the colonial expedition to Earth from planet Nibiru. Sitchin wrote that Enki suggested that to relieve the Anunnaki, who had mutinied over their dissatisfaction with their working conditions, that primitive workers (Homo sapiens) be created by genetic engineering as slaves to replace them in the gold mines by crossing extraterrestrial genes with those of Homo erectus. According to Sitchin, ancient inscriptions report that the human civilization in Sumer, Mesopotamia, was set up under the guidance of these “gods”, and human kingship was inaugurated to provide intermediaries between mankind and the Anunnaki (creating the “divine right of kings” doctrine). Sitchin believes that fallout from nuclear weapons, used during a war between factions of the extraterrestrials, is the “evil wind” described in the Lament for Ur that destroyed Ur around 2000 BC. Sitchin states the exact year is 2024 BC. Sitchin says that his research coincides with many biblical texts, and that biblical texts come originally from Sumerian writings. Since the release of his first book The 12th Planet in 1976, now in its 45th printing, Sitchin wrote seven other books as part of his Earth Chronicles series, as well as six other companion books, all of which are still in print as of 2012. Sitchin’s books sold millions of copies worldwide and been published in more than 25 languages, as well as in braille. New York Times reporter Corey Kilgannon noted that despite academic dismissal of his work, Sitchin had “a devoted following of readers”. Critic Michael Heiser called Sitchin “arguably the most important proponent of the ancient astronaut hypothesis over the last several decades”. Sitchin was a frequent guest on the Coast to Coast AM radio show, which in 2010 presented Sitchin with a lifetime achievement award.Gods of the New Millennium author Alan F. Alford admits he initially became “infatuated” with Sitchin’s hypotheses but later became a critic of Sitchin’s interpretations of myth. According to some writers, Sitchin’s ideas along with those of Erich von Däniken may have influenced the beliefs of the religious sect of Raëlism, and writer Mark Pilkington sees the mythology of Japan’s Pana Wave religious group as rooted in Sitchin’s The 12th Planet and its sequels. The 1994 movie Stargate, directed by Roland Emmerich, and the 2009 video game The Conduit drew some conceptual inspiration from Sitchin’s ideas, while screenwriter Roberto Orci says the villains of the film Cowboys & Aliens were inspired by Sitchin’s conceptualization of the Anunnaki as gold-mining aliens. Criticism of Sitchin’s work falls primarily into three categories: translations and interpretations of ancient texts; astronomical and scientific observations; and literalism of myth. When Sitchin wrote his books, only specialists could read the Sumerian language. However, sources such as the 2006 book Sumerian Lexicon have made the language more accessible to non-experts. Sitchin bases his arguments on his personal interpretations of pre-Nubian and Sumerian texts, and the seal VA 243. Sitchin wrote that these ancient civilizations knew of a twelfth planet, when in fact they only knew five. Hundreds of Sumerian astronomical seals and calendars have been decoded and recorded, and the total count of planets on each seal has been five. Seal VA 243 has 12 dots that Sitchin identifies as planets. When translated, seal VA 243 reads “You’re his Servant” which is now thought to be a message from a nobleman to a servant. According to semitologist Michael S. Heiser, the so-called sun on Seal VA 243 is not the Sumerian symbol for the sun but is a star, and the dots are also stars. The symbol on seal VA 243 has no resemblance to the hundreds of documented Sumerian sun symbols. Sitchin’s linguistics seems at least as amateurish as his anthropology, biology, and astronomy. On p. 370, for example, he maintains that “all the ancient languages … including early Chinese … stemmed from one primeval source — Sumerian”. Sumerian, of course, is the virtual archetype of what linguistic taxonomists call a language-isolate, meaning a language that does not fall into any of the well-known language-families or exhibit clear cognation with any known language. Even if Sitchin is referring to written rather than to spoken language, it is unlikely that his contention can be persuasively defended, since Sumerian ideograms were preceded by the Azilian and Tartarian signaries of Europe as well as by a variety of script-like notational systems between the Nile and Indus rivers. Sitchin’s “planetary collision” view does superficially resemble a theory by modern astronomers—the giant impact theory of the Moon‘s formation about 4.5 billion years ago by a body impacting with the newly-formed Earth. However, Sitchin’s proposed series of rogue planetary collisions differ in both details and timing. As with Immanuel Velikovsky‘s earlier Worlds in Collision thesis, Sitchin states that he has found evidence of ancient human knowledge of rogue celestial motions in a variety of mythological accounts. In Velikovsky’s case, these interplanetary collisions were supposed to have taken place within the span of human existence, whereas for Sitchin these occurred during the early stages of planetary formation, but entered the mythological account passed down via the alien race which purportedly evolved on Nibiru after these encounters. … implies an orbit with a semi-major axis of 235 astronomical units, extending from the asteroid belt to twelve times farther beyond the sun than Pluto. Elementary perturbation theory indicates that, under the most favorable circumstances of avoiding close encounters with other planets, no body with such an eccentric orbit would keep the same period for two consecutive passages. Within twelve orbits the object would be either ejected or converted to a short period object. Thus, the failed search for a trans-Plutonian planet by T.C. Van Flandern, of the U.S. Naval Observatory, which Sitchin uses to bolster his thesis, is no support at all. Sitchin in “the case of Adam’s alien genes” states that 223 unique genes found by the Human Genome Sequencing Consortium are without the required predecessors on the genomic evolutionary tree. Later researchers have argued that the conclusion from the Human Genome Sequencing Consortium cannot be drawn due to a lack of a comprehensive gene database for comparison. An analysis by Salzberg identified 40 potential genes laterally transferred into the genome from prokaryotic organisms. Salzberg also argues that gene loss combined with sample size effects and evolutionary rate variation provide an alternative, more biologically plausible explanation. He uses the Epic of Creation Enuma Elish as the foundation for his cosmogony, identifying the young god Marduk, who overthrows the older regime of gods and creates the Earth, as the unknown “Twelfth Planet”. In order to do this he interprets the Babylonian theogony as a factual account of the birth of the other “eleven” planets. The Babylonian names for the planets are established beyond a shadow of a doubt—Ishtar was the deity of Venus, Nergal of Mars, and Marduk of Jupiter—and confirmed by hundreds of astronomical/astrological tables and treatises on clay tablets and papyri from the Hellenistic period. Sitchin merrily ignores all this and assigns unwarranted planetary identities to the gods mentioned in the theogony. For example, Apsu, attested as god of the primeval waters, becomes, of all things, the Sun! Ea, as it suits Sitchin, is sometimes planet Neptune and sometimes a spaceman. And the identity of Ishtar as the planet Venus, a central feature of Mesopotamian religion, is nowhere mentioned in the book—instead Sitchin arbitrarily assigns to Venus another deity from Enuma Elish, and reserves Ishtar for a role as a female astronaut.